Tap the menu icon ( ) in the top left corner of your screen. Search By Work Order ID - Type a Work Order ID number in this field to bring up the work order details. 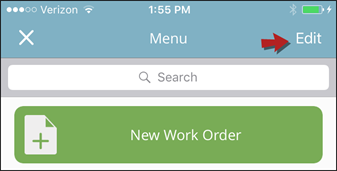 New Work Order - Tap this to access a new work order form. 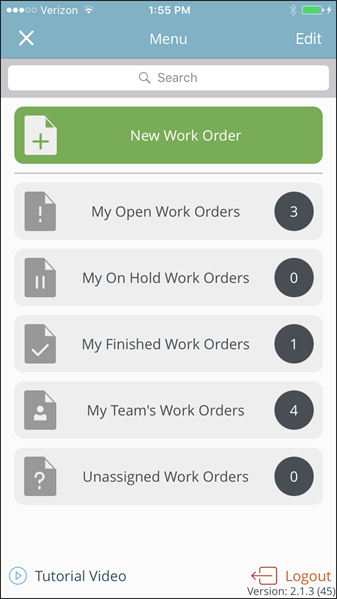 My Open Work Orders - View a list of your assigned new and in progress work orders. My On Hold Work Orders - View a list of your assigned work orders that have been placed on hold. My Finished Work Orders - View a list of the work orders that you have marked as completed, declined, or duplicate. My Team's Work Orders - This option is only available to Administrators and Supervisors and shows a list of work orders assigned to users that report to them. *Note: These Reports To assignments are made under the User Profiles in Work Order. Unassigned Work Orders - This option is only available to Administrators and Supervisors and shows a list of work orders that need to be assigned to a technician for completion. You can assign the work to a user directly from this screen. Tutorial video - View a tutorial video on how to use the Work Center app. Logout - Tap this to log out of the Work Center app. You can customize the Work Center Menu by adding your own custom filters. From the main menu, tap the Edit button. You can delete any unnecessary menu filters by clicking on the trash can icon ( ) next to the menu you'd like to delete. To add an additional menu filter, tap Add New Menu Filter. Type in a Name for the filter. Select an Assigned To if you would like to filter the work orders in this menu filter to only show work order assigned to a particular person. You can also choose to show your team or work orders that are Unassigned. Select any Statuses you would like to filter this list for. Tap Create Filter to add this menu filter to your main menu.